I’ve Found The Missing Aviator Bust! 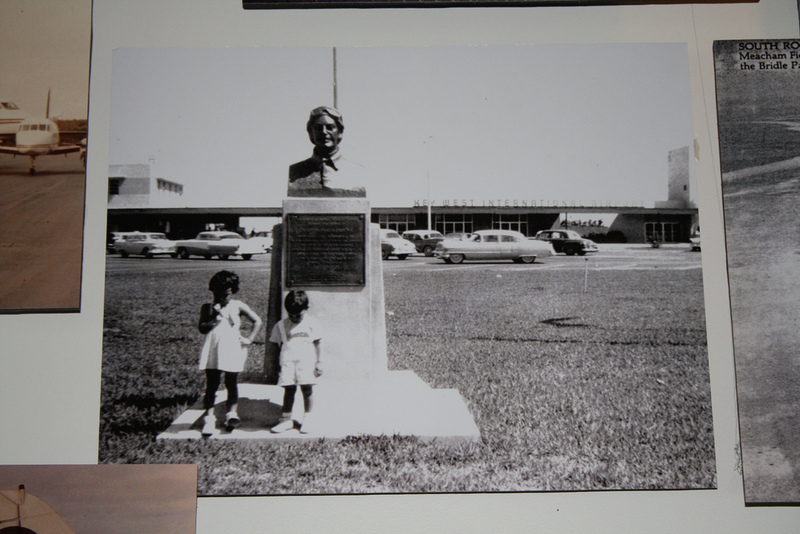 For half a century this bust sat in front of the Key West airport greeting its cloud-bound patrons. So who is it, what did it commend and where is it now? Inquiring minds what to know, so I set out on a quest in pursuit of answers. I’ve been to the Key West International airport many times never setting sight on this statue. In seeing this historical photo I went back out to the airport to see it myself wondering how in the world I could have missed it. On my third attempt in finding this, we parked the car and walked all around the new parking garage that now sits in front of the airport approximately where the statue should have been to no avail. We then asked a security guard if he knew anything about the missing bust… pausing a moment he responded “There’s some busts up in the departure terminal.” Off we went and sure enough we found it. It had been moved years ago and brought inside for outgoing passenger to see before leaving Key West. Upon the bronze plaque it reads: “The county of Monroe, state of Florida renders this tribute to Agustín Parlá Orduña born in Key West on October 11, 1887, of Cuban parents exiled during their country’s struggle for independence. Who was the first man to fly the 119 miles over the sea from Key West, Florida to El Mariel, Cuba on May 19, 1913. Honor to his memory.” Dedicated way back in July 4, 1957.